Here in New Zealand, it's just turned midnight, which not only means that 2014 is finally here, it means I'm in the future and you still could be in the past (hears X-Files whistle playing). 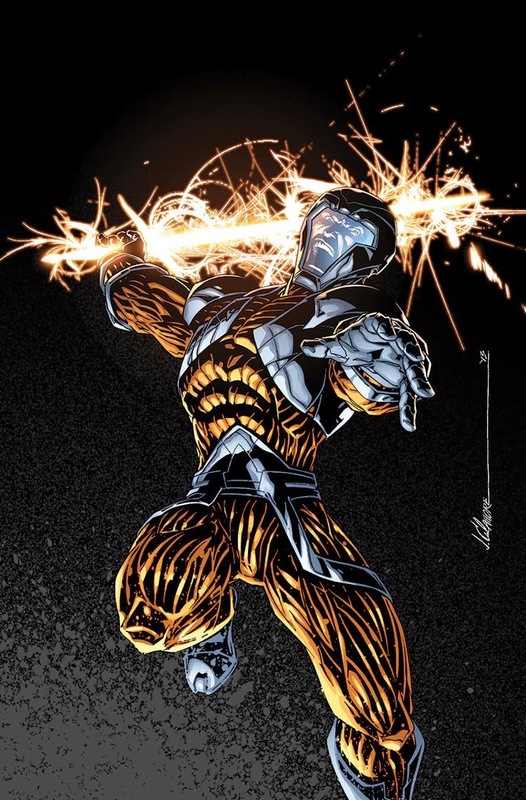 Now hopefully in seeing the New Year in, you unlike X-O Manowar by Jim Calafiore here, remember to let go of any fireworks you're intending to let off and not carry them around. For this site, 2014 is going to feature a few changes. The look has already had a bit of a Mystique n' Clayface, and over the next few weeks you'll see new features roll out as well. Combined with the return of Making a Mark, newbies like the sidebar's Freeze Frame, wider space for art and trailers, plus all the usuals like Now Comes The Cosplayer and The Comics Beat, and I really think we are really going to have a lot of fun looking at the awesomeness of the various comic universes, the talent that makes them so, and the efforts fans go to in return. But enough about that, my complimentary 'Adam Strange' jetpack has arrived now the future is here and after strapping it on, I'm going to order up a storm at my nearest 24hour McDonalds drive through. Thanks for helping get me here - your support is the greatest of all. Now go enjoy the New Year! Hey, Dan Happy New Year! Its still only 5.30 in the late afternoon here as I write this and for us in the UK 2014 wont appear until tomorrow, still nothing like starting the celebrations early! Great new features on your new site by the way. Words do look a bit tiny though. Hey Karl! Thanks for the feedback glad you like the new look.I've noticed words in the sidebar are pretty tiny too. Will fix as I go. Already one day in to 2014 here and summer has got in going down fine. Happy New Years! Happyy New Year Dan! Loving the new look. Looks to keen and futuristic. I love it! Best wishes for the new year to you and your mum. Glad you dig it Dale! I originally drafted a new look that was more of a change, but I like my orange to much! Plus, what's not better with Firestorm on the left there? Hope this year is great for you, your Dad and all ya mates and mate-esses. hey Dan, what prompted you to start a IADW face book and twitter page? also, I dig how you have all those categories of posting subjects organized in your side bar column. so Dan, all this stuff from Valiant and what not are you picking it up on a regular basis? believe it or not I actually picked up a couple of IDW Dredd issues late last year because of my enthusiasm about the movie. they weren't bad but I just didn't like them enough as to pay $4 for them every month. same goes for some of the Star Trek stuff I read from IDW last year. it always comes down to the same thing at the end of the day when it comes to what I really want to read. I wanna read some good Suicide Squad and some good treatment to the Rom legacy. in the absence of that I just can't generate any real interest in new stuff. Hey Dave! I've had Facebook and Twitter going for IADW for a while now, they just might stand out a bit more in the new layout. Both are developing followers of their own, which is cool. Not everything that makes the blog goes on social media and vica versa, yet as long as they help spread the word about comics, illustration and the awesome things fans do to appreciate great comics then I'm all for it. I currently buy all the Valiant titles but two - not that those two aren't great stuff, my wallet just won't let me divert food money! From the new Eternal Warrior series with flashbacks of the immortal's life by Clayton Crain to X-O Manowar and books like Lazarus from Image (which I highly recommend to everyone), I'm a happy comics camper reborn. Yeah, price tags are really an issue on comics huh? I don't think I would follow if they went much higher, although in my currency $4 a comic would be a Godsend. While the intellectual property generators The Big Two are risking becoming could dig the line at $3, I still think comics could make the price work. Ed Brubaker packs the back pages of Fatale with 'DVD extras', pulp history lessons and more and really helps add to the books weight. Also (and I REALLY mean this one) I truelly think we could offer a range of black and white comics with strong enough art teams and run those at a cheaper rate. Black and White Batman, Spectre, Suicide Squad, Etrigan, Sandman, Doctor Strange, Daredevil, Walking Dead, Judge Dredd, Transformers, G.I. Joe, and more - there's not a one that doesn't suit the medium - some of them suit black and white more than they do colour! Thanks as always for the thoughts mate.